Have you heard of our upcoming Muttropolitan Gala? This evening will include a selection of silent auction items donated by our generous sponsors, delectable hors d’oeuvres, and a cash bar. Entertainment for the evening will be provided by students from the University of Lethbridge’ music department and speakers from both Windy City and IME will present. Visit : The Muttropolitan Gala for more information. Today the IME cohort teams presented their fundraising charity event proposals for Windy City Canine Rescue(WCCR) to Mike Madore, Project Management professor Alireza Tajbakhsh, and the executives at WCCR. 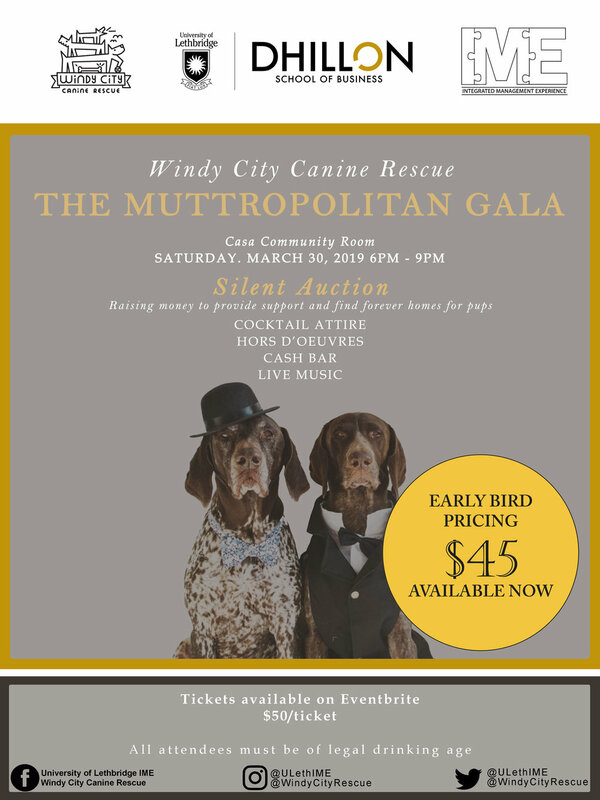 The goal of this fundraising event is to help raise money, awareness, and volunteers for Windy City Canine Rescue. The videos of the teams’ presentations will be uploaded soon to all of our Facebook platform, so stay tuned! Please use the link below to watch all of them on our Facebook page and vote on your favourite! No matter which team wins, we hope that all of IME will be able to execute a great fundraising event that will help Windy City Canine Rescue get more donations, awareness, and volunteers. Congratulations to all IME teams on their hard work and dedication for their presentations! IME students representing the University as Student Ambassadors for the day. In the midst of planning our No Horsin' Around Culinary Cook-Off, a few of us IME students were able to take a day off to attend the Greatness in Leadership Conference at the Enmax center this past Thursday. This years theme for the conference was "Discovering Greatness" and showcased a number of incredible speakers who exemplified exactly that. The day started off with a speech from Darci Lang presenting her message of focusing on the 90%, AKA focusing on the positives and building a happier life by doing so. Darci spoke to how no one's life is perfect and that we all face various trials and tribulations, but reminded us that we can't let our adversities define us or our lives. One of the main lessons I took away from the day was her idea of complaining about an issue three times at most and then "laying that sucker out," meaning if after three times of complaining about some situation, if it still hasn't changed, then do something about it. Don't keep focusing on the negatives, the 10%, but rather do something about it and turn the situation around. It's a lesson I've already been applying to my own life, and I have to say, in even just under a week I've started to notice a difference. Not only do I feel less stressed and negative about situations, but I've noticed the effect it has on my relationships, another result Darci said to look forward to. The happier you are and the more you focus on the 90%, the more the people around you do as well, and the happier and more positive your professional and personal relationships are. The next speaker of the day was Steve Carlisle, the president and managing director of General Motors of Canada. His story of starting his career off as an industrial engineering co-op student and working his way up to his current position was both interesting and inspiring. He presented any ideas on the importance of innovation and the future of technology, and left listeners with the main message that determination is really the key to success. Lunch was, of course, delicious and I was lucky enough to be sitting at a table with Lethbridge Iron Works, who coincidentally is one of our major sponsors for our IME fundraiser! I was able to thank them for their generosity as well as learn more about the company that's been in Lethbridge for 120 years! After lunch and a little bit of networking we heard from Catriona Le May Doan, a two time Olympic gold medalist. Her speech looked at "leadership with a purpose." Her perspective was that great leadership is doing what it takes to help others reach their full potential. She spoke about a couple different ways we can do this and used her own personal experiences as both an Olympic athlete and as the lead athlete mentor for these past 2018 Winter Olympic Games. The first method she spoke to was leading from the front and paving the way for others, something she did when she became the first Canadian Olympic athlete to defend a medal at the Olympics. The second leadership method she spoke to was guiding from the back as a mentor, and supporting those you are leading. One of the main messages that I took away from her speech was that leadership is a commitment to both ourselves and to others to do more than we thought possible and to help others find success in their lives. The next speaker of the day was Connie Podesta, and although I'm pretty biased I thought her talk on leadership and creating a culture of accountability, and closing deals more effectively was the highlight of the afternoon. Now I say I'm biased towards Connie's speech as very close to the beginning of it I was called up out of the audience to join her on stage for a portion of her presentation. It was an exhilarating, albeit incredibly nerve-wracking, experience to be up in front of that many people, but it was an experience I will never forget. At the end of it Connie presented me with her watch and sent me to enjoy the rest of her speech, which was still incredibly enjoyable as she combined her history in comedy and therapy to make her points. Following her presentation Connie found me in the audience and gave me a hug, thanking me, and telling me to never forget that I am the future of leadership and innovation. It truly was an amazing experience. Following a break to network and eat more incredible food, it was time for the days main event: the keynote speaker Dr. .Robert D.. Ballard, the man who found the titanic, and other significant shipwrecks. His story of being a young child wanting to be "Captain Nemo" and the journey he went on to become one of the most distinguished discoverers in the world was fascinating. In addition to finding the titanic (when he was actually supposed to be on a top-secret government mission retrieving nuclear weapons from sunken Cold War submarines, using the titanic search as a cover story) he played a key role in developing telecommunications technology which has changed the world of undersea exploration. Dr. Ballard told many stories of his discoveries and how he has led numerous teams in making some of the biggest undersea discoveries. He truly did exemplify the days theme of discovering greatness. Over all the entire day was really enjoyable, and I am so glad I had the opportunity to attend the event. I left having met a number of wonderful, hard-working, intelligent people. and learned so many lessons that will help me prosper, not only in the business world, but in my own personal endeavors as well. Plus I got a new watch too, so now I'll always knowwhat time it is! This week marks the first week of classes in the new year. As we, the IME cohort, pick up where we left off, we reflect on and celebrate the past semester and its accomplishments. Our last and perhaps most meaningful project of 2017 was the creation of a strategic plan for the Lethbridge Therapeutic Riding Association (LTRA). This plan was challenging as each IME group had to try to understand the obstacles and goals the LTRA has, in order to create a relevant and effective plan. To develop the strategic plan, we utilized the skills we learned in our design thinking workshop in order to collaborate and create impactful solutions. We found this to be an effective method to generate ideas, but needed to take a more traditional approach to compile the ideas into a format that made sense. Once we developed our plan we were tasked with presenting it to the LTRA board members. Each group who presented was filmed for the review of the public and the LTRA board. Based on the number of likes/views on Facebook for each of the videos a winning team was selected. We would like to congratulate Franchesca Lee, Ethan Musil, Tasha Silver, and Austin Vandal for their hard work and dedication to the project and their success in winning this competition. We would also like to recognise the remaining three teams for their dedication and effort in building a plan for the LTRA. Each group did very well, and the LTRA has informed us that they will be using aspects from each plan to create their future strategic plan. This project was a great way to wrap up the semester. We are looking forward to our continued work with the LTRA and the exciting opportunities that 2018 will bring. Hello readers of the IME student blog, whether you be current IME students, parents of current IME students, prospective students, faculty, or members of the community! I'm Kaleigh, and I am managing the class website along with my teammates: Spencer, Emily, and Reanne. We are very excited to be sharing updates with you all as the year goes on. We will be working hard on our studies, case competitions, consulting with Lethbridge Therapeutic Riding Association, and balancing everything else that goes on in the busy life of a student, so all you need to do is sit back, read, and enjoy! We started out our IME journey by getting acquainted with each other and our professors for the semester: Jim Clark, Adriane MacDonald, and of course, Mike Madore! Luckily there was food that morning to help everyone wake up! There was some housekeeping to take care of, but soon enough we were taking our personality tests to get matched up in our cohort groups that we will be working closely with over the next 8 months. For those of you who don't know what these groups are, they divide the class into groups of about 4 or 5 people who have complimentary personality traits. We determined these traits by taking the Gallup Strength Finder test, which is a great way to gain insights on one's personal strong points. Essentially, these groups will be working together to manage the multiple social media platforms we have for IME, as well as doing important casework with each other. The morning we found out who was in our cohort groups we were given the opportunity to do an icebreaker activity to get us all working together right away! Mike sent all the groups on a scavenger hunt, with first prize being a free Subway lunch (well... free for everyone except Mike)! The groups set off on their campus-wide search for hidden gems and iconic landmarks. Some clues left people guessing, while others led the groups directly to some well-known spots. Although our group was not successful in winning ourselves an all expenses paid Subway lunch, we are thankful for the opportunity to have had some fun and get to know each other better by working on this activity together! I'm sure all the other groups could say the same! In other news, we are well underway in our Management Information Systems component of the class curriculum. We also just completed our first live case, which we will post about soon! We have also updated the Current Students section of the website, so feel free to check that out so you can read more about each member of the IME class. That's all I've got for now! Stay tuned to the blog for more updates on the progress of the IME class. Looking forward to an amazing year!